Its been a little while since I wrote a crafty blog. Its mostly because I have been working hard and planning for my upcoming three months off. But I have been knitting in the midst of all this madness and I’d like to share what I’ve completed to date. 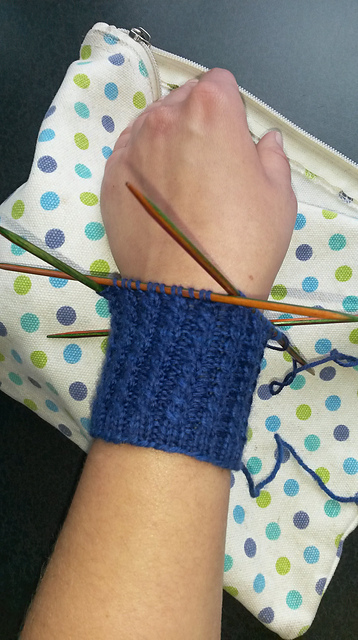 First up, what I nicknamed as the Ribbing of DOOM project – a pair of fingerless mitts for my friend Bran. 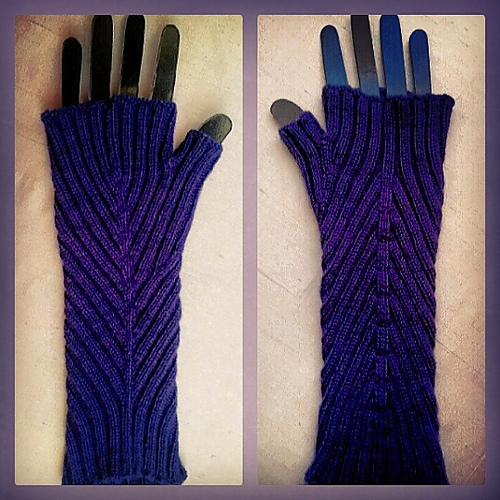 It took me 5 months to complete these mitts, and it was mostly due to sheer boredom. 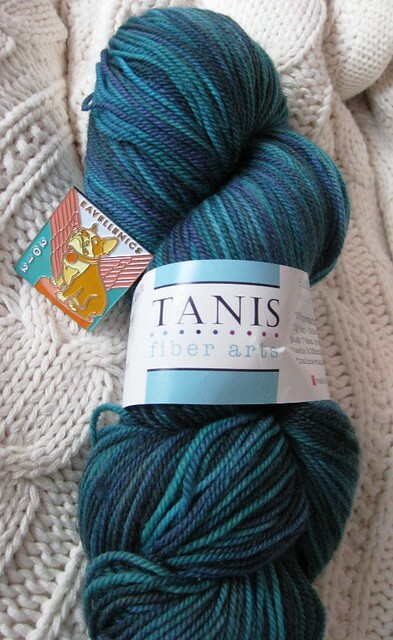 I’ve come to realize that while I love the look of ribbing, I’m not a fan of knitting it forever in a fine yarn. In this case, I was downright masochistic, I was using lace yarn held double. Shoot me now! But I’m happy to say that they are all done, and the finished product looks good! I unfortunately don’t have any photos of Bran wearing these mitts, but I have a feeling she won’t be needing them until autumn arrives. Bran-warmers. This photo shows both sides of the radiating rib pattern. Yardage out: 791.7 yards out with points for stash-down! Next project – a hat for a particular dude. This hat was meant for my boyfriend for Christmas, but we broke up in January and have recently begun reconnecting again. So I decided it was time to make the hat he should’ve got for Christmas (and to get him to quit grumbling about it LOL). 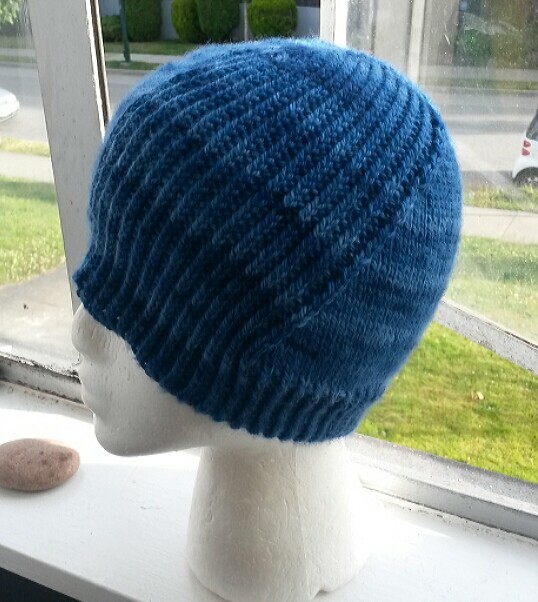 Yarn used: Muse Merlot Aran in a gorgeous royal blue palette. Notes: it only took me 6 days to knit and block this project. Ah, I love the ease that comes with quick projects! As I alluded to in an earlier blog post, I’m leaving shortly to go away for 3 months to travel to Ireland, Portugal, Spain, and Morocco. While I’m away, I’ve assigned myself two knitting projects (and neither of them were part of my original plan that I wrote about previously). One, I’ve started, and the other I will start while away. Traveling project #2: Stepaside Socks which was free for the month of July (score!) but is now back to a paid pattern. I have yet to figure out which yarn to use for this project, but perhaps this one that I won as part of the Ravellenic Games a few years ago? Whatever yarn I end up using, I’ll need to dig it out of my yarn stash (which is a mess right now due to all the packing going on in my house), wind it, and get whatever needles/notions together so I have everything with me while I’m on the road. I’ll be blogging on a different site, but if I come across something really cool and crafty on my journeys, I’ll blog here about it. So long for now! I love the look of ribbing, too, but that’s worse than the 250 meters of 2×2 ribbing I found interminable in my “High Speed” Knitting scarf! Good for you for finishing. You are currently reading Tying up some loose ends at When Gaia Smiles.